If you are not comfortable where you sleep, you won’t be comfortable anywhere else. The key to sleeping well, apart from the comfort of the mattress and the pillow, is a comfortable environment. Redecorating your bedroom can be fun and provide an often-needed change of scenery. Redecorating your bedroom is not as hard as it might sound; it truly can be hassle free. Consider what you like and what you don’t like about your current bedroom, and start working on the things you want to change. If you just want a new look and you’re not sure where to start, here are a few tips. One of the most visually bothersome things in a bedroom is clutter. Scattered books, scarves, or even hair ties make your bedroom feel and look smaller. So, step number one to redecorating your bedroom is buying appropriate storage and figuring ways to clear the space as much as you can. It will also make changing things around much easier. Try under-the-bed boxes for books or winter gear. As for smaller items, maximize your drawers’ capacity by using snappers — white dividers that allow you to section any drawer or box according to your needs. They can be found at any dollar store. Before redecorating your bedroom, think of your comfort first. Buy curtains to add to your blinds if you find the sun too strong for you in the morning. Then, use the colours in the curtain as a colour palette to redecorate your bedroom with bed sheets, wastepaper baskets and photo frames. Invest in a new quilt in a new colour and bring a new touch into your bedroom. After taking care of the clutter and making sure that your bedroom is comfortable, you can start playing around with the decor. Fresh paint is always a great look — nothing changes the look of a room more than a new colour. If you want to refresh your whole bedroom, be sure to pick out new paint on your way home. Change up your lighting. If you have a tall lamp, try buying two beside lamps instead. Or, buy a new ceiling lamp with a completely different design and feel to it. You can also incorporate some candlelight into your bedroom decor — it will bring a Zen element and a soulful vibe into your room, not to mention lovely scents! One way to play up newly incorporated colours in a bedroom is by adding a small rug. You don’t want to add too much furniture or crowd your space. 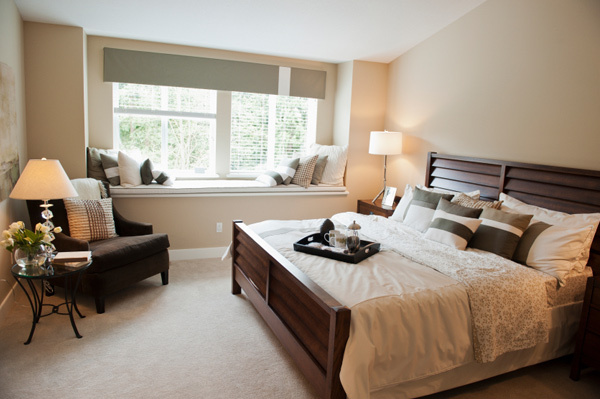 A rug, however, can add warmth to your bedroom without leaving your space looking smaller. A bedroom is meant to be personal! Fill it up with photo frames and collages. Add your favourite quote on the wall, or a calendar and a to-do list. A bedroom is where you can go crazy with your decor and everything and anything is fair game.